Fleming’s Prime Steakhouse & Wine Bar has introduced its newest private label wine – Forty-Six Diamonds, Cabernet Sauvignon, Sonoma Valley, 2008 – which is available in each of its 64 restaurants across the country, including two Chicago area locations: 25 E. Ohio St., Chicago; 312-329-9463, and 960 Milwaukee Ave., Lincolnshire; 847-793-0333. Marian Jansen op de Haar, Fleming’s National Director of Wine, partnered with famed California winemaker Walter Schug and his son Axel of Schug Winery to bottle this 2008 blend. Walter Schug was the winemaker for Joseph Phelps in 1974 when they introduced Napa’s first officially recognized Bordeaux style blend, the iconic Phelps Insignia. The grapes for this year’s Forty-Six Diamonds were sourced from four outstanding Sonoma Valley vineyards: Rancho Salina, located in the hills next to the famous Monte Rosso vineyard; Atwood, located in a cool, foggy patch on the valley floor near Kenwood; and Horne and Ricci, both in Carneros. The wine is a big, polished Cabernet-blend with dark cassis, plum, blueberry and black currant fruit flavors, with fine-grained integrated tannins and a long finish. Fleming’s produced its first private label Forty-Six Diamonds in 2007 and since that time has collaborated annually with premium wineries and winemakers to create a wine that is truly one of a kind. 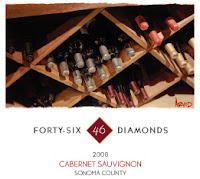 Other winemakers who have collaborated in the creation of Forty-Six Diamonds in past years include Michael and Rob Mondavi, Jr. of the famed Napa family, Ken Deis of Flora Springs, and George and Frank DuBoeuf of Beaujolais. According to Jansen op de Haar, in 2011 Fleming’s will partner next with Salvatore Ferragamo of Il Borro Winery in Tuscany, Italy. Thomas Arvid, internationally renowned artist and wine aficionado who was commissioned to create the label for this handcrafted boutique wine, also assisted in the blending of Forty-Six Diamonds. Each year, his label design features a diamond shape in homage to the wine’s name. Arvid’s oversized still life paintings of wine and the rituals around it adorn the walls of every Fleming’s Prime Steakhouse & Wine Bar across the country. The nationally acclaimed Fleming’s Prime Steakhouse & Wine Bar offers the best in steakhouse dining – Prime meats and chops, fresh fish and poultry, generous salads and side orders—with a unique wine list known as the “Fleming’s 100” that features 100 wines served by the glass. Fleming’s was launched in Newport Beach, California in 1998 by successful restaurant industry veterans Paul Fleming and Bill Allen. Today there are 64 restaurants nationwide. Fleming’s is the recipient of numerous prestigious awards, including Wine Enthusiast’s annual Awards of Distinction and Wine Spectator’s annual Awards of Excellence. For more information, please visit www.FlemingsSteakhouse.com.